If you want to be nice and cool when it's hot, cheaply and kind to the ecology, a portable evaporative or swamp cooler is the perfect climate control solution for your needs. There are a great many benefits to choosing this method of air cooling in your home as well as outdoors. So which one will you choose for your home? There is a considerable variety of different brand makes and models to choose from and you'll want to get the right one for your needs. So to be sure you make the right decision, we have put together a big comparison section of all the top models so you can review the best of them all in one place. But first off, let's talk a little about what swamp coolers are, what they can do, how they work and what their advantages and disadvantages are. In its simplest terms, this is a box with a fan in that supplies the room with chilled air through a process of evaporation. It sounds simple and in reality, it really is simple! This type of climate control unit is more correctly called an evaporative cooler since the way it works to keep you cool is by the evaporation of moisture. 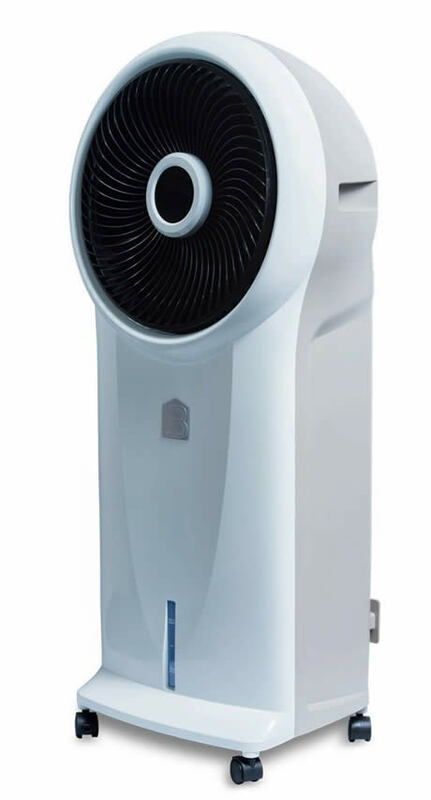 This is very different to a more conventional air conditioner that uses a refrigeration process to create chilled air. Let's take a look at just how one of these devices works to get a better appreciation of the simplicity of what's going in inside the casing. If you put some water in a bowl and blow on it, your breath hits the water and rebounds off, giving you a nice and cool breeze on your face. That's because your warm breath evaporates the surface of the water which causes it to reduce in temperature, resulting in cooler air coming off it. Your body uses the same principle in sweating to regulate its temperature and keep you cool when it gets hot. The sweat wets your skin and any breeze evaporates it, causing your skin to feel cool. An evaporating cooler mimics this principle by using a powerful fan to draw room temperature air into the unit, force it through a damp membrane, evaporating the moisture which chills the air that is pushed out the other side. The membrane is kept moist by a refillable reservoir or water below. The water reservoir can also be filled with ice to increase the units ability to reduce the room temperature by as much as 25-30 degrees Fahrenheit in most situations, depending on the ambient humidity levels already in the room. Since there is no heat exchange (as with an AC), no ozone-unfriendly CFC gasses for the refrigeration process and no complex air pumping system, a swamp cooler is very simple to manufacture, cheap to assemble and even cheaper to run day to day. Let's look at what makes this type of air cooler so much more economical than conventional air conditioning. Why is a Swamp Cooler So Much Cheaper to Run than AC? To create chilled air, an evaporative cooler only needs to pass air that is drawn in from the room through a permeable, damp membrane and force the now chilled air out the other side. It does that with nothing more than a powerful fan, which is the main user of electricity in this type of device. A swamp cooler has no need of a power hungry compressor, heat exchange or refrigeration process like a regular air conditioner, so it only uses electricity to power the fan. 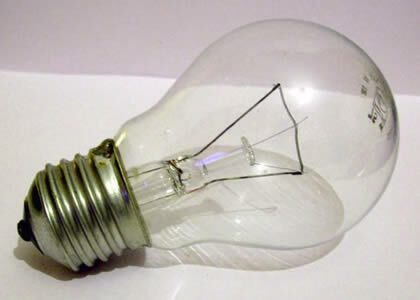 As most fans only use between 50-100 watts, they are no more costly to run than a standard incandescent light bulb! A medium sized portable unit will use less than 100 watts of electricity, compared to more than a kilowatt (or two) for a comparable AC unit. So it doesn't take a lot of working out to see how much one of these units will save you in running costs over a summer period! Why is there No Hot Air Exhaust Vent? As mentioned above, there is no heat exchange process in a swamp cooler. I'll explain what one of these (as found in a regular air conditioner) is first to help you get the idea. A heat exchange is a process found in air conditioning units whereby the warm air of the room is pumped through a complex refrigeration process that chills the air before it expels it into the room. Much like the refrigerator in your kitchen, an AC unit chills the air it needs but there is a price for all this cold air. The other half of the exchange process produces hot air, which needs to be expelled away from the room it is cooling, or you'd end up with a net increase in temperature. Just go stand by your fridge and feel the hot air coming off its motor in back! An AC uses a venting process that forces all that unwanted hot air out of the house through a vent in the wall. A fixed AC unit will be connected through an external wall to an exhaust fan outside. A portable AC has a trailing corrugated plastic hose that must be placed in a suitable opening on your home's external wall so the hot air can escape to the outside. You have probably seen them, or maybe you have one or more in your home. The vent is rather unsightly and is often dangled out of a window which then needs to be sealed up with plastic to stop the hot air getting back into the room. That incidentally is a big downside to using a portable AC! On the flip side, a swamp cooler has no heat exchange, so it doesn't produce any hot air. That means there is no need to vent to the outside and that means no unsightly vent hose. Yay! What you have is truly portable air cooling. That's because a movable swamp cooler is not restricted by the need to hang a venting hose out a window or other suitable portal to the outside. Being truly portable means one of these units can be easily wheeled from room to room wherever and whenever you want to enjoy its cooling breeze and to reduce the temperature in a room that has become too warm. The best part is there is no "chemical" smell that you often get from portable AC units, since the process is all-natural and ecologically friendly. It all sounds so good, you must be wondering what disadvantages there must be or everyone would be buying these machines up like crazy! Well, there is one major downside to what are otherwise amazing appliances. For an evaporative cooler to work at its optimum capability, the humidity in the room being cooled must be relatively low (no higher than around 50%). When the humidity levels get too high, the evaporation process loses effectiveness as the air becomes saturated with moisture. To give you an example of why this is, if you have ever been on vacation (or you already live) in a place with very hot, humid weather, you will have experienced feeling very hot and sticky but sweating doesn't cool you down. That's because there is too much moisture in the air for "cooling by evaporation" to work. The same problem afflicts swampies. If you try and use one to cool down in very humid conditions, you are going to be disappointed. This is why they are only recommended for use in relatively dry climates. You can improve efficiency somewhat by cracking open a window or door to allow a cross breeze to take some of the moisture from the air in the room, but if the outside humidity level is close to 100%, you're not going to get much of an effect. In this case, a regular AC wins! On the flip side, if you live in an area that had predominantly hot, dry air for most of the summer, you are totally in luck. That's because you will get the maximum benefit from one (or more) of these money saving, surprisingly powerful chilling machines in your home. They love dry air because the evaporation process works best when there is little or no moisture in the air. That means one medium sized machine will do its job of chilling a regular size room down between 20-25 degrees for very little power consumption, saving you a lot of money over the course of the summer. If you have a larger space or want a solution for keeping the whole of your house cool, there is the option of buying several individual portable units, installing window units or whole house systems. I look at larger installations in a separate article where it can be explained at length without adding several more paragraphs to this home page which is already getting rather long! Which Model is Best to Buy? There are, as I mentioned above, several very good makes and models on sale in stores both in the real world and online. The best of these will be the one that suits your individual wants and needs most closely. For that reason, we don't recommend a single unit ahead of all the rest because there are several top models that excel in different situations. Please take a look at the comparison reviews by clicking that link to open that page.